​All Day Eye Cream is gentle, and penetrates easily to hydrate your skin. It aims to repair signs of aging that appears on the skin around the eyes, such as dark circles, eye bags and wrinkles. 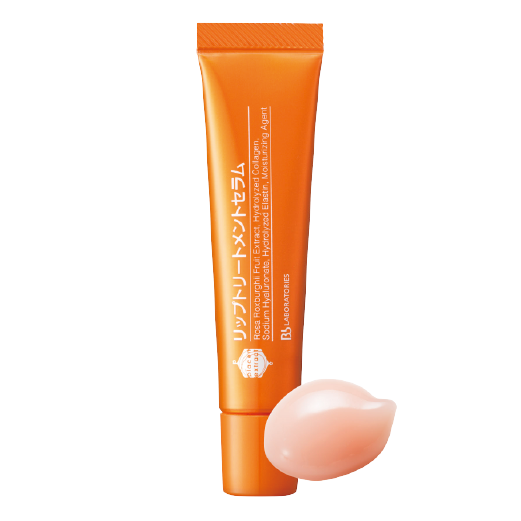 The eye cream stimulates skin renewal to bring about a youthful glow. The formula contains tremella fuciformis polysaccharides, glycosyl trehalose and other moisturizing ingredients, which forms a protective film, providing the skin with the necessary moisture for 24 hours. Additionally, trifolium pratense flower extract, soy isoflavones, punica granatum extract and other mimic female hormones help moisturize the skin, creating a firm and radiant complexion. Angelica polymorpha sinensis root extract, mandarin orange peel extract and chrysin carry anti-oxidizing and whitening properties, which help correct dullness and dark circles caused by poor blood circulation around the eyes. Take an appropriate amount with the ring finger. Apply on the lower and upper lids in circular, upward and pulling motion from the inner eye to the temple. Benefiting by the freeze-drying technology, it instantly freezes up and dehydrates the hyaluronic acid, elastin, collagen elements, natural plant extracts, Vitamin A and other ingredients. It efficiently keeps all the components in a stable status which do not destroy or affect its original function. This skin set can effectively smoothen facial and eye wrinkles, repair dry and UV damaged skin and skin cells. It gives promising result to tackle problem of aging wrinkles, fine lines and skin laxity at eyes and around mouth area. Only seven days of continuous use, the skin regains a healthy shine. Add the extract into the powder bottle up to▼symbol. Cover the cap and mix it well. Pat half of the mixture over the cleansed face. Use every day in the morning and evening. Each bottle of mixture should be used within one day. pFd Placenta Power Mix is a special anti-aging formula. In addition to the extraction of cell growth factors in the Placenta such as Epidermal Growth Factor (EGF) and amino acids, while adding yeast extract and mannitol, it can enhance the function of locking skin moisture, strengthen collagen layer, and improve wrinkles problem. Extra added fat-soluble Vitamin C can effectively bring out the whitening and anti-oxidizing function; it can also improve uneven skin color and pigmentation problems caused by the ultraviolet rays. Benefiting by the freeze-drying technology “FD”, it instantly freezes up and dehydrates the placenta elements in the skin set, efficiently keeps all the components in a stable status which avoid destroying or affecting its original function. Only seven days of continuous use, the skin regains elasticity and moisture, and pigments significantly lightens up, and skin leaving skin in white glossy and healthy shine. Contains hyalurone acid, elastin and collagen, which promote collagen synthesis, restore firmness, improve wrinkles and lock moisture in your lips. Maxi Lip™ moisturizes lips and makes them firmer, smoother and better defined. Theobronma cacao seed butter is well-known as a moisturizer and its function as an antioxidant. It slows down the aging process by limiting the effects of environmental free radicals, which cause cellular damage. Rosa Roxburghii fruit extract, Vitamins C and E help promote blood circulation, and thus improve dull and chapped lips. They also help to restore the healthy and natural color of the lips. The combination of ceramide, royal jelly and honey form a shield that retains moisture and enhances the self-protective ability. Apply a small amount of serum by fingertips and gently massage the lips, or use it directly over your lip color to give a natural shine. Neckline Clear Gel is formulated with calcium, essential amino acids, which smoothes the area around the neck. The rosa damascena essential water helps to retain moisture, even skin tone, and stimulate skin cell regeneration process. The gel also contains arbutin, which reduces production of melanin. In addition, the shape-adhering gel gently lifts and firms along the neckline for youthful-looking skin. After cleansing, take an appropriate amount in the palm and gently massage around the neckline and chin with circular movements until fully absorbed. Combine with the use of Placenta Extract and Placenta Extract Water to maximize the benefits. Dullness and dryness is the common sign of aged women with hormone imbalance. 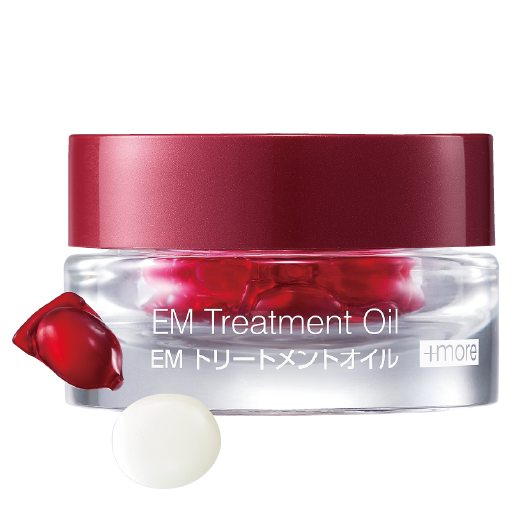 EM Treatment Oil is tailor made for them. Each capsule contains 11 moisturizing oils extract, Vitamin C derivative and dipalmitoyl hydroxyproline, which can penetrate deep into the skin to restore moisture, softeness and firmness. The extracts from Ylang ylang and sandalwood can help skin relax and unwind. Apple seed extract is proven in Europe as a good anti-aging agent for smooth and radiant skin. Each capsule are sealed tightly, hence the content is always fresh. Use one capsule before bedtime, your skin will be silky smooth and radiant. After extract or emulsion. Cut off the tip of capsule, squeeze the content into the palm and gently massage onto the face and neck. Use every day in the evening.